Wiggly upper arms that continue to flap after you've stopped waving need an intervention. To the rescue comes the triangle push-up, a move that a study sponsored by the American Council on Exercise in 2011 named the No. 1 exercise for training the triceps, the muscles at the back of the upper arm. All push-ups use the triceps for assistance, but the triangle variation turns them from helper to prime mover. Along with the triceps, many of the muscles of the upper body and the core work to push you up and down in this challenging move. The triangle push-up is simple enough to execute, if you have the strength. It's not a complicated movement, but it is challenging. Get onto all fours with your hands under your shoulders and your knees under your hips. Walk your hands slightly forward to create a straight line from your shoulders to your hips. The tops of your knees remain on the mat. 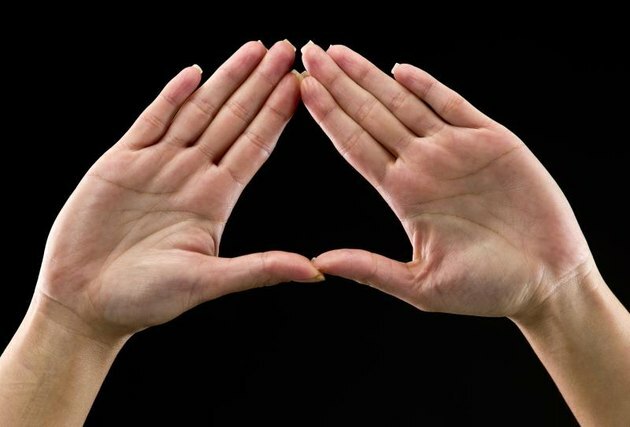 Bring your hands together under your chest so your fingers form a triangle -- your index fingers form the point and your thumbs touch to create the base. Bend your elbows to lower your body. Keep your abdominals pulled in toward your spine to maintain core integrity. When your chest almost touches your hands, extend your elbows to return to the start. Once doing 12 repetitions of the exercise on your knees becomes easy, graduate to balancing on your toes with your body in a straight line -- a full plank position. Another way to progress the exercise is to place your hands in the center of a medicine ball as you push up and down. This instability requires your core to work even harder to keep your body steady. The triceps are the primary muscle worked during the triangle push-up. This three-part muscle rests at the back of your upper arm and is responsible for extension of the elbow joint. The triceps help you in pushing and pressing actions, such as when you drive a stroller or grocery cart or push a heavy box across a wood floor. Pectoralis Major: This is the primary muscle of the chest. It, too, is important in pressing and pushing movements. Anterior Deltoids: Your deltoids form the cap on your shoulders and are comprised of a rear, top and front portion. Respectively, these sections are known as the posterior, lateral and anterior deltoids. The anterior deltoid works with the chest to press you up and down. Serratus Anterior: The right and left serratus anterior rest somewhat to the side of the chest, under the armpit area. They cover the first eight ribs. Core Muscles: Your core muscles, including the rectus abdominus, your six-pack, and the obliques at the sides of your middle, provide stability to your trunk so your hips don't drop too low or lift too high. Stabilizing muscles of the back also provide assistance in keeping your core rigid. The triangle push-up is so effective because it discourages cheating. You can't use momentum like you can when swinging a weight or pushing a weight machine. Your triceps are entirely in control of your body weight -- it's all your muscles working. Read More: What are Your Bicep and Tricep Muscles? The American Council on Exercise also rated dumbbell kickbacks and dips highly in their ability to activate the triceps muscles. Use these exercises interchangeably with triangle push-ups to achieve greater strength and shape in your upper arms.